I parked at a parking garage off Adams Street. It's a 6 block walk to the book fair location from there. There is a closer parking garage but I keep forgetting about it. I really should look into it because where I parked is $$$. I head towards the book fair and am stopped by color. Huh? 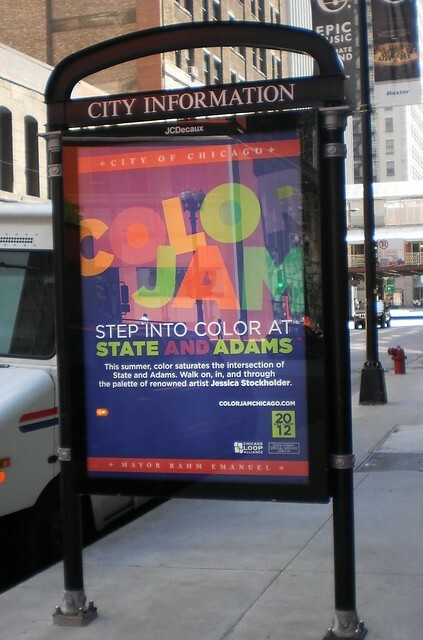 I stand at the corner of State and Adams in Chicago and there is color all around me, big blocks of color. It's on the light poles, the street, the buildings. Chicago is well-known for it's urban art. 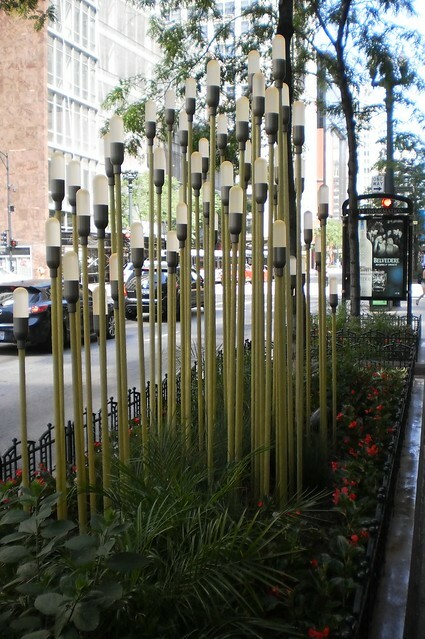 From statues to landscaping, "art" in all forms can be found all over the city. 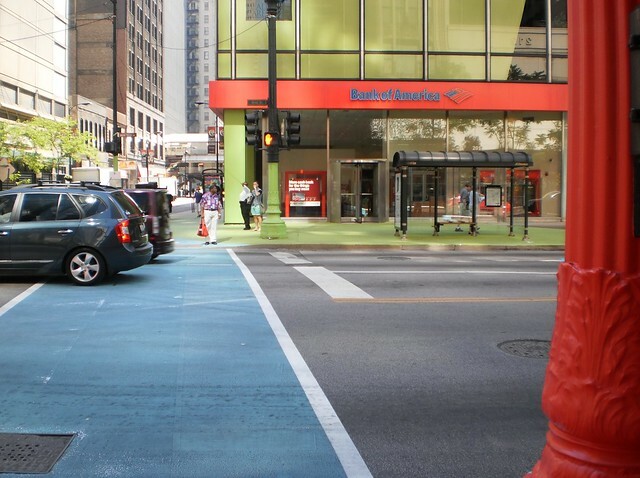 The former mayor, Richard M. Daley, made it a point to bring art into and around the city. Probably his most famous success was the fiberglass cows that populated the city in 1999. That was so much fun and I know of suburbanites who went into Chicago for the first time just to see the cows. 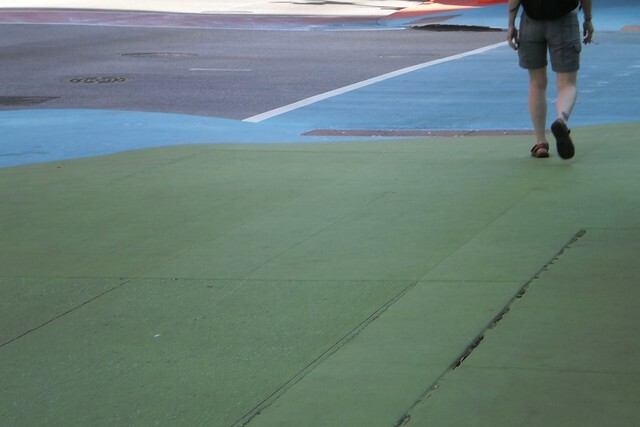 So, art and the experimentation with it interacting in an urban environment is nothing new for the city. That's what this is. Art in an urban setting. I didn't know about this, which made it serendipitous and really intriguing. There is an accompanying sculpture. According to the placard, this is to "move" with the music. I assume those are lights which will come off and on based on the music piped around the spot. There was one on both the west and east sides of State Street as I walked to the fair. They weren't lighted but there was music, 1970's light rock at the time I passed, very early Elton John and "Goodbye Yellow Brick Road". That alone made me giggle. I like this. I like the whimsy. I like the bold. I like the planting of color in the midst of one of the most iconic locations in the city. 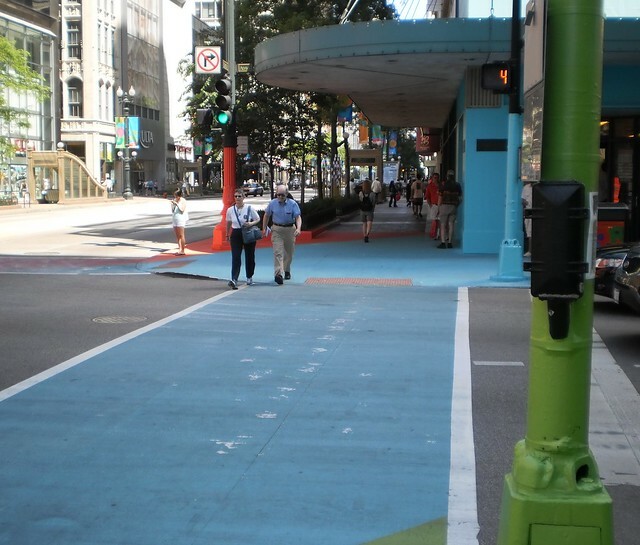 Will it make people think about how color influences their environment? Probably not. 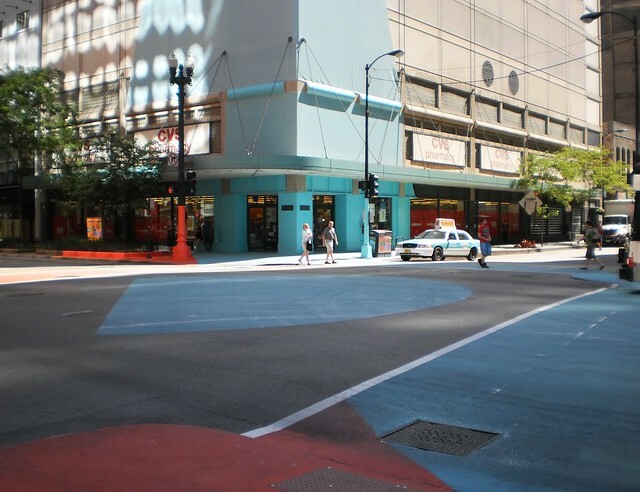 Had this been done at every intersection along State Street, then yes, I think it would have. Carry the turquoise north and change the other colors. Then carry one of those colors farther north and add two more. That would have been really cool. But, that's my only quibble and it's minor. I like this experiment in urban art. If you live in the area and are downtown, go check it out.